Happy New Year! Okay, I have to admit that the new year began a week ago, but my kids didn’t return to school until today. In other words, I was so busy enjoying Christmas Vacation that I am just now getting around to wishing all of you a Happy New Year. I hope your holiday season was filled with family and friends. Ours was big and boisterous! We spent part of the kids’ vacation riding horses and sorting cattle. This may have been my favorite part of the holiday. 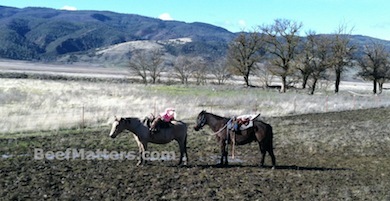 It was a beautiful day which made for an enjoyable ride for all of us, especially the younger kids. 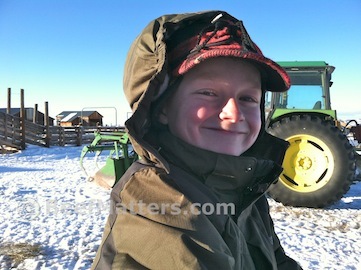 Speaking of the younger kids…Have I told you about sorting cattle? 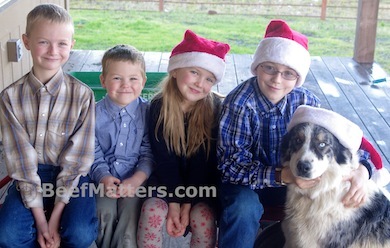 It’s a relatively simple process and a frequent event on the ranch. We gather all of the cattle in the field and trail them to a corner in the fence. 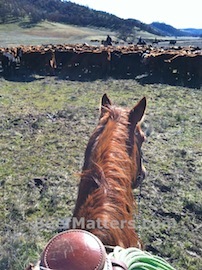 We take up strategic positions around the cattle to contain them in a general area while one cowboy (or cowgirl) wades into the middle of the herd and starts sorting out different cattle. 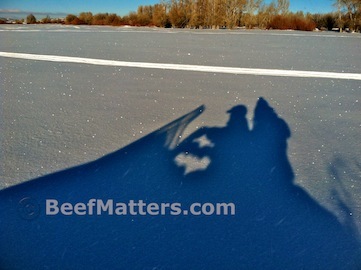 On this day we were sorting out a load of cattle to take to some pasture we have leased that’s about thirty miles north of our ranch. It takes some time to sort cattle and for those that are not actively sorting and are tasked with “holding the herd” this can become a somewhat boring job. Fortunately, there were fascinating cloud formations that entertained the youngest cowboys that day. The remainder of our vacation days were spent playing in the snow. We went to Wyoming to visit my parents which is always a treat. My Dad had the snowmobiles ready when we arrived. The kids all enjoyed zooming around on the snow. I found myself being a passenger more than a driver, which was a bit of a switch! This little boy got quite a kick out of driving his mother around.